Hey, look what I found in the garden yesterday morning? That’s right, it’s a baby eggplant! A baby ‘Millionaire’ eggplant, to be precise. 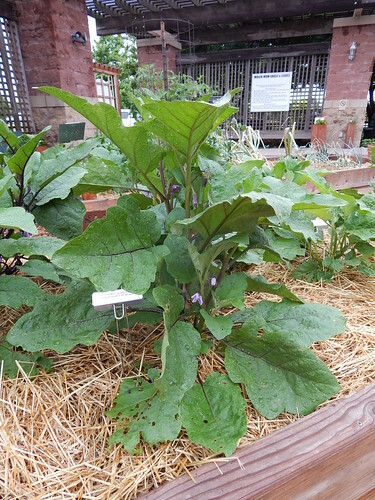 Some of the other eggplants are growing well and starting to flower also. Here’s another plant that is starting to flower. In the background you can see another variety that is still quite small. If you read this blog with any regularity at all, you know that I make a semi-regular joke out of my disdain for eating eggplant. I like growing it, I think it is a pretty plant, but I am just not excited to eat it. So, for all of you eggplant lovers out there, here’s your challenge: Give me a recipe to try that you think will change my mind about eggplant. I’ve already got an eggplant parmesan recipe, so don’t give me that recipe unless you have a significant change/improvement on it. My family will eat almost any cuisine and any spice/flavor profile, so there are no restrictions there. We can also pretty much cook with any technique, so no restrictions there. I’ll make an effort to try several different recipes and share the results with you throughout the summer. I’ll even come up with some sort of spiffy rating system. (Maybe 5 yuck faces, 3 yuck faces, 1 yuck face, a meh-take-it-or-leave-it face, and a I’ll tolerate it half-smiley face? Okay, just kidding.) So leave a comment with your recipe or send me an email. (rmcmahonATksuDOTedu) I’ve already got a list of several interesting recipes started, so I want to see what your favorites are! 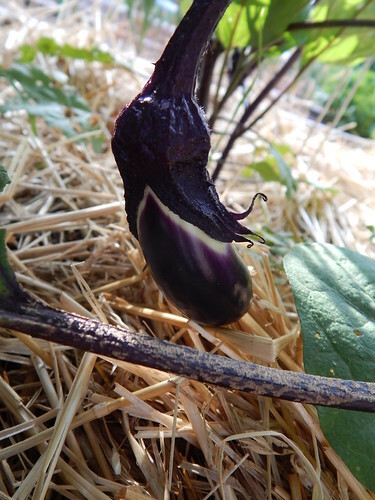 Posted on June 19, 2013, in Around the Garden, Harvesting & Eating and tagged cooking, eggplant. Bookmark the permalink. Leave a comment.